This is the Prodigy Hyrdating Lip Gloss in Legend and the Visionaire Eye Shadow Duo in Prism. Check out that packaging! Have you ever seen anything like it? It's so futuristic looking. Note the curved molded applicator. No wand or sponge type applicator, which I like because it seems just a little bit more sanitary. The cap doesn't twist or screw on at all- it just snaps on. In fact, removing the cap feels a little bit like snapping the gloss in half, but that's how you're supposed to remove it- twisting will actually break the tube. I feels wrong at first, doing something that seems like it will break the item, but you get used to it after the first few times. The cap is also so shiny and reflective that you can use it as a mirror. It seems like a lot of thought went into making a completely different type of tube because it's really nothing like any other gloss I own. And if you think that's cool, take a look at the Visionaire eyeshadow compact! 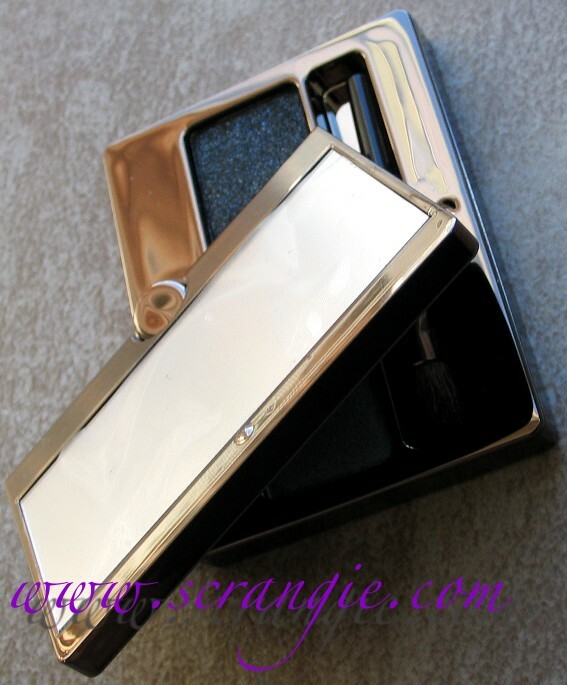 It has a mirror and contains a brush that is actually useful. Not one of those wimpy plastic-bristled mini brushes like in some eyeshadows. This one is just like a mini version of a full-sized shadow brush, similar to the brushes that come in the MAC holiday shadow palettes. The mirror will swivel into any position you want! You can turn it completely backwards, you can stand it straight up, lay it flat, anything. Now, I normally apply my makeup in front of a mirror to begin with so it's not terribly useful for me, but I can't say it isn't interesting and innovative. 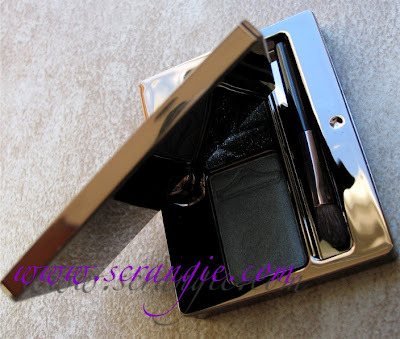 It may be more geared toward people who travel or carry a makeup bag. Enough about the fascinating packaging, let's talk about what's inside. Please enlarge these images if you so desire. I keep them huge so you can see the detail close up. 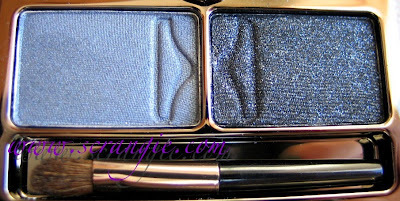 The Visionaire eyeshadow duo in Prism contains a smoky grey shimmer on the left and a very pigmented black with rainbow shimmer on the right. It's imprinted with the image of an hourglass- that actually took me a few minutes to figure out. It's the hourglass logo. These shadows are 0.10 oz each (0.20 oz total). These are the items swatched over bare skin- no primer or anything. Check out that shimmer in the black shadow- it has prismatic qualities to it- it reflects a rainbow of colors when the light hits it just right. At first I thought it was just plain silver microglitter, but then when I saw it in sunlight I was amazed. The Prodigy Hydrating lipgloss is very nice. While the shade I received, Legend, isn't quite right with my pale cool skintone, I am in love with the formula. 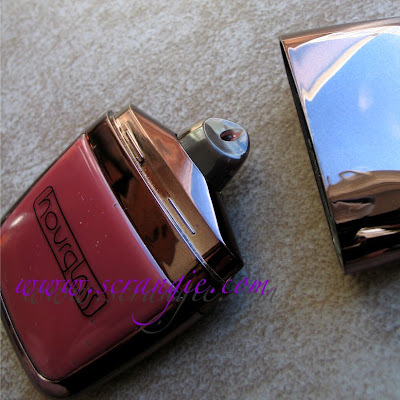 Legend is a warm sheer shade with a good amount of shine and no shimmer. They claim that the gloss formula is long-wearing and water resistant, and it really is. It lasts longer than most glosses, even after drinking. Polybutene, Mineral Oil, Petrolatum, Mineral Oil/Paraffinum Liquidum, Octyldodecanol, Silica, Pentaerythrityl Tetraisostearate, Butylene/Ethylene/Styrene Copolymer, Ethylene/Propylene/Styrene Copolymer, Ethylene/Propylene/Styrene Copolymer, Trihydroxystearin, Tocopheryl Acetate, Calcium Aluminum Borosilicate, Silica, Tin Oxide May Contain: Mica (CI 77019), Titanium Dioxide (CI 77891), Iron Oxides (CI 77491), Iron Oxides (CI 77492), Iron Oxides (CI 77499), Blue 1 Lake (CI 42090), Carmine (CI 75470), Red 7 Lake (CI 15850), Red 33 Lake, Yellow 5 Lake (CI 19140). The gloss itself has no perceptible flavor or scent. It barely even smells like gloss. This is a downside for me because I prefer everything to be scented, but I know a lot of people who prefer an unscented gloss. I would love to try this in a shade that compliments my skintone more because I really enjoy the formula. As for the Visionaire eyeshadows, they're just as nice. The texture is so dense and velvety. The packaging describes them as "sheer" but that couldn't be farther from the truth. They're so pigmented you barely have to apply any at all! The black half is quite honestly, the best black shadow I own. 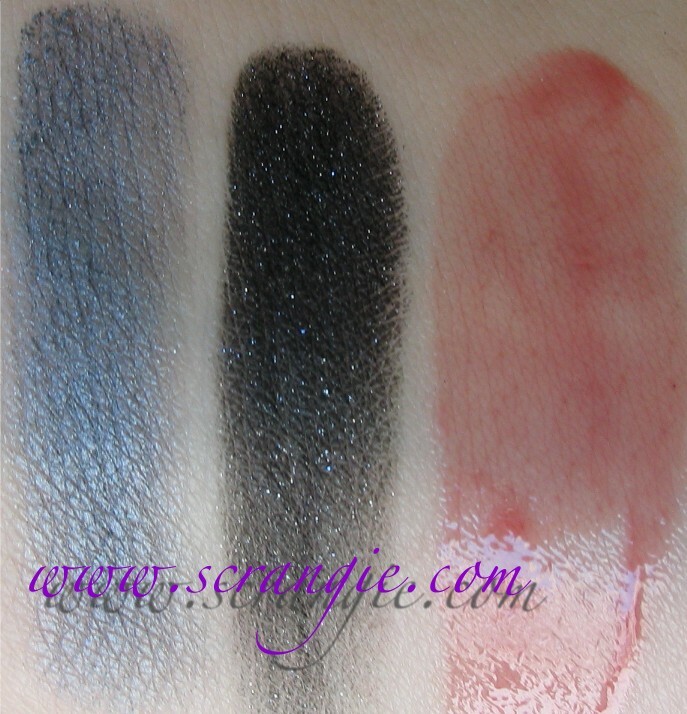 The pigment is just amazing and it blends so well without getting streaky or losing intensity. Both the shades apply effortlessly and blend perfectly. They seem to have a bit of a sticky or creamy texture to them that helps them adhere to the lid. 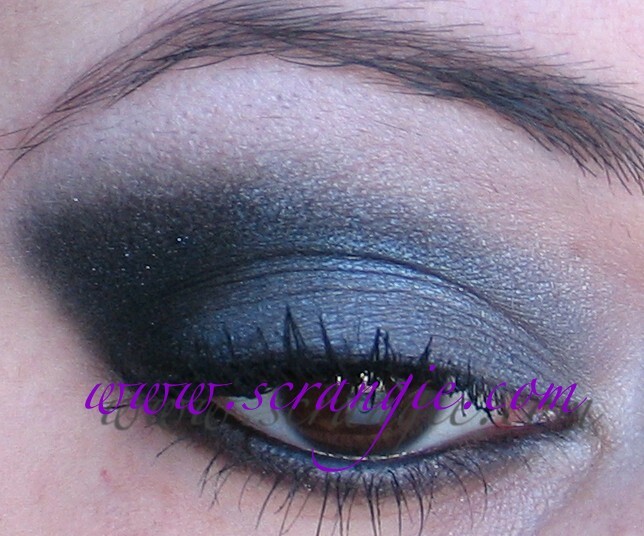 I used the black in the crease and the grey on the lid over a base of Too Faced Shadow Insurance. They are a joy to apply. I'm really impressed with the texture and pigmentation. 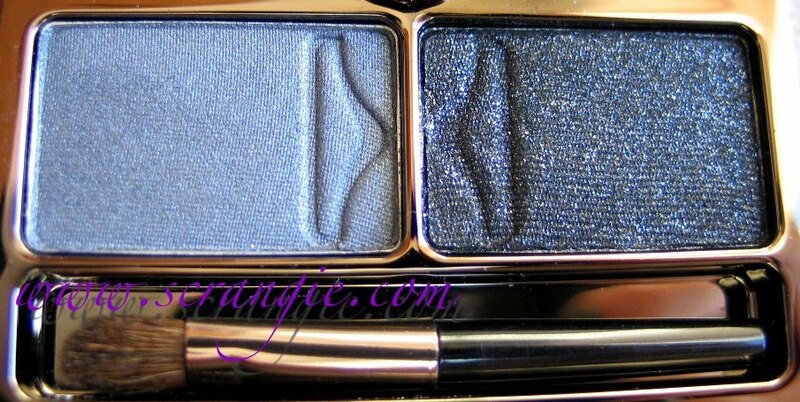 Despite the amazing pigmentation and formula, there were a couple of issues that I experienced with these. 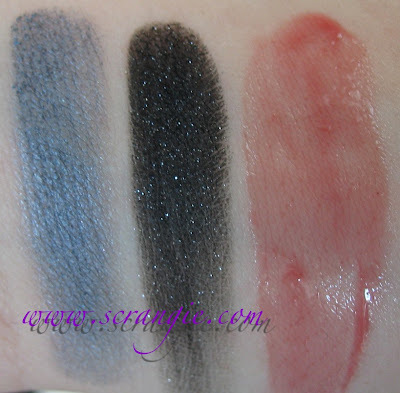 The black shadow, after blending, loses most of the rainbow shimmer. This is a minor issue as it can be easily remedied by gently patting on a little more shadow after blending. That's what I did when I wore this look. It sticks really well so the shimmer/glitter particles won't fall off all over your face. The other issue I had was with the grey half. I wore this exact look three times, each time over Too Faced Shadow Insurance, and each time I experienced significant fading and creasing on the grey. On two occasions, the grey color was completely gone after about 9 hours while the black still looked freshly applied. This is very puzzling to me. I almost never experience fading and I can't even remember the last time my shadow creased. Is it not compatible with my primer? Is it reacting with my body chemistry? Is it a problem with the shadow itself? Like I mentioned before, the black shadow still looks absolutely pristine and not the least bit faded or creased after the same amount of time. Does anyone have any insight as to why this is happening or have you experienced the same thing? Talc, Zinc Stearate, Ethylhexyl Palmitate, Nylon-12, Cyclopentasiloxane, Polysilicone-11, Silica, Lauroyl Lysine, Methylparaben, Propylparaben. May Contain: Mica (CI 77019), Titanium Dioxide (CI 77891), Iron Oxides (CI 77492), Iron Oxides (CI 77491), Iron Oxides (CI 77499), Carmine (CI 75470), Ultramarines (CI 77007), Manganese Violet (CI 77742), Blue 1 Lake (CI 42090:2), Chromium Oxide Greens (CI 77288), Ferric Ferrocyanide (CI 77510), Tin Oxide (CI 77861), Black 2 (CI 77266). Talc, Zinc Stearate, Triethylhexanoin, Boron Nitride, Lauroyl Lysine, Methylparaben, Propylparaben. May Contain: Mica (CI 77019), Titanium Dioxide (CI 77891), Iron Oxides (CI 77492), Iron Oxides (CI 77491), Iron Oxides (CI 77499), Carmine (CI 75470), Ultramarines (CI 77007), Manganese Violet (CI 77742), Chromium Oxide Greens (CI 77288), Ferric Ferrocyanide (CI 77510), Tin Oxide (CI 77861). All of this incredible packaging and luxurious formula does come at a cost. This is one of the higher-priced brands I've encountered at Sephora. The Prodigy lipgloss is $26 and the Visionaire Eyeshadow Duo is $38 (!!!). While the formula of the products I used was much nicer than anything I've ever used from other higher-priced brands like Chanel or Dior (whose eyeshadows I'm convinced are made of pure sidewalk chalk), seeing those numbers makes me a little lightheaded. Though, if they sold the black half of the Prism duo as an eyeshadow single for $19, I wouldn't hesitate to buy it, it's that good. I've only seen Hourglass Cosmetics at Sephora, so I'm not sure where else it's available for purchase. So, what do you think? Have you used Hourglass before? Never even heard of it but the packaging is beautiful beautiful. Those are REALLY COOL products! 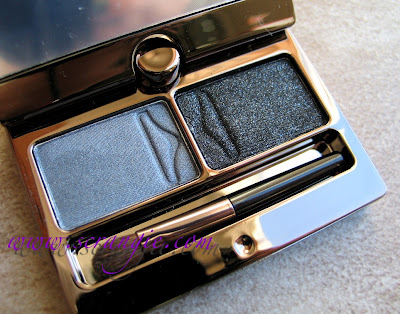 I always thought Hourglass was like too high-end for me, but that packaging is WAY cool! For some reason, I have a problem with silvery blue shades creasing on me as well... I have a Mac shadow similar to that one and it creases on me. Every. Single. Time. I haven't found a solution yet! I'm not much of a silver & black e/s girl, but the look you did with those e/s is pretty amazing! My absolute favorite foundation is Hourglass Veil Fluid Makeup Oil Free SPF 15. I really love that packaging! 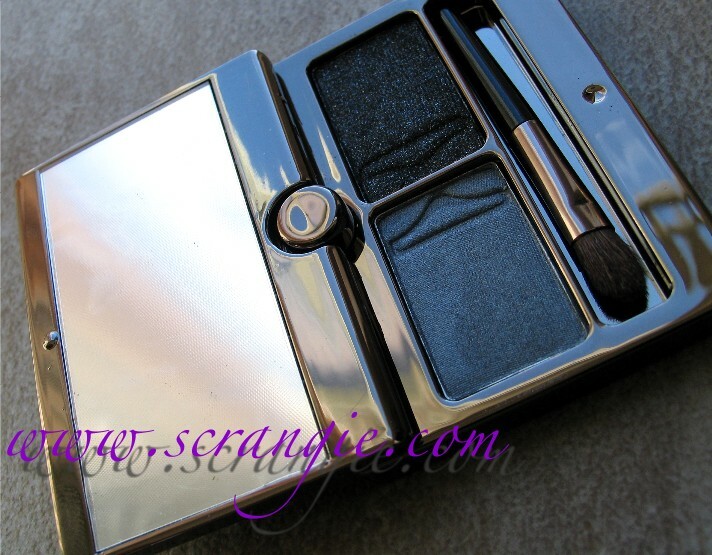 The packaging is super and the colors look so pigmented, really great staff!! I'm a makeup nut and I've never heard of this brand. I'm on Sephora's website at least two or three times a week, too (not in the store, though, because we don't have one in my hometown...just Ulta)! Strange. The packaging is, of course, gorgeous. I love the look you did with the eyes. I think I'm going to spring for some of this gloss when my financial situation improves. I'm always looking for the "perfect" gloss and this seems like it would fit the bill. Love it! I loooooove Hourglass. I have a few of their discontinued palettes (the ones that had 6 eyeshadows/2 blushes or bronzers) as well as their primer and some glosses. The pigmentation and quality is really through the roof, better than brands like Chanel and Dior. They are pricy, but well worth it if you can spare the cash. the packaging is very beautiful! and your look too. i was just wondering....what camera and lens do you have? its amazing! Lovely eyemakeup and the packaging is wonderful. Haven't tried Hourglass before, but I do like the lighter shade on you. Careful with that gloss! The packaging is beautiful but the cap pops off easily on its own. I had to stop carrying it in my purse. 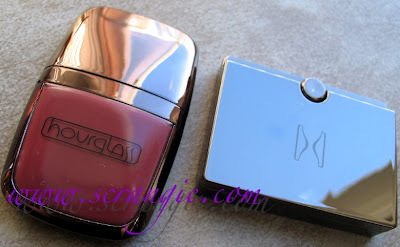 I also love Hourglass Mineral Veil, it has a beautiful bottle - only gripe would be the fact that it's a dipstick that you swipe onto your hand and then apply the cream to your face. The texture of it is amazing, my bf described it as 'a bazillion microscopic balls in oily cream', it feels so strange and it sinks into the skin without vanishing away. I love it so much and it works really well on my oily skin. I love the packaging! So awesome. Maybe you have already addressed this in one of your posts, but what brushes do you use to apply eye shadow? It always looks so perfect and perfectly blended! LOVE that eye on you. 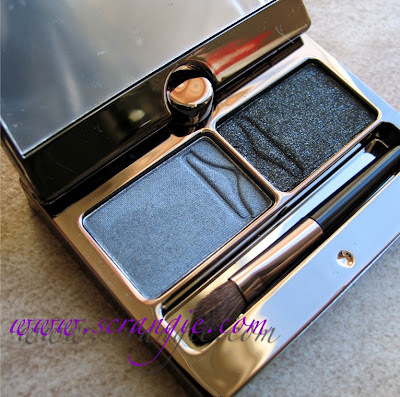 I have been dying to try the eyeshadows rather all the rave reviews. I don't know why but I dismissed this line initially, even though I was impressed by the foundation. I will have to try it. Xtinerat, ahh, thanks for the warning! Yikes! Tara, I use mostly MAC and Smashbox brushes and sometimes my fingers! Smashbox actually makes really awesome brushes! Great post! There is a professional salon makeup line called Mirabella (sold at SalonCentric, aka Maly's) that also has the flat lip gloss packaging.. In fact, it's exactly the same, and they came out with it around the same time as Hourglass, even though it's totally different from the rest of their packaging. 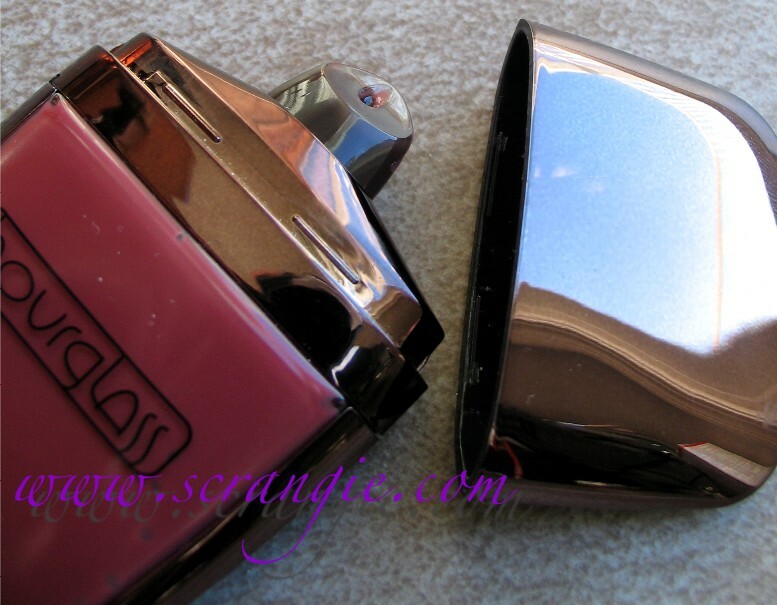 So I think maybe there's a packaging company that sold to both of them, which means we're probably going to see a lot more of those... kind of how those twisty Stila lipgloss tubes burst onto the market however many years ago. I bought a couple of the palettes they had about 4 years ago from the Hour Glass website. They were $80.00 a piece, but I loved them. The quality was great, the color combinations were perfect and the packaging was awesome. I was really pleased to see the line at Sephora, but I was disappointed to find the palettes were discontinued. There were 6 eyeshadows and a blush/bronzer and both of my palettes were pretty neutral. I am a medium olive skin tone and they were great for me. All the colors were wearable, didn't fade for me, I use UDPP, and I am extremely oily. I felt they were worth every penny, the pigmentation was great, the texture was a whole lot better than any Chanel or Dior shadow I have ever used, and the colors didn't oxidize into some unnatural weird orange color like most colors do because of my oily skin. I still have about half of each shade left in my palettes, and about three quarters of the blush/bronzers left. I will be bummed when it comes time to replace them, the newer colors aren't quite the same shades, but I really like them. OPI Black Shatter over Color Club Jackie OH! Peace and Love Nail Kit from TJ Maxx! Peter Philips and the Chanel robot? Crayola by Fing'rs Nail Art Decals!